According to preliminary estimate from the Office of Traffic Safety, the current count of traffic fatalities stands at 65 for 2019. At the same time last year, the corresponding number was 53 which was worse than the previous year. Review of data from 2017 to 2019 shows fatality count was 357 in 2017, 380 in 2018 and 2019 is disappointingly trending upward again. Although official analyses by various governmental agencies estimate 20-25 percent of the fatalities attributable to distracted driving, many researchers claim that these numbers are under-reported due to enforceability challenges. The Minnesota State Patrol also agrees with the researchers. Despite the No Texting While Driving Law in the state, troopers find it difficult to catch drivers in the act without a telescopic camera or a telescopic vision. That is an unrealistic expectation! Last year Minnesota tried in vain to mitigate this situation with a simple, no-nonsense solution. Just do not allow drivers to hold phones in their hands while driving. Instead require them to use a dash-harness for the cellphone with or without a Bluetooth capability. When the drivers are not holding the phone in their hands, the state troopers can easily catch those touching the screen while driving, a texting law violation. Both House and Senate did enjoy bipartisan support, but somehow the bill never made it to the floor. This was regrettable. This year the story is encouraging. Last week the bill passed in a landslide in the House. The governor has endorsed the bill and will sign it when it gets to his desk. At the time when I am writing this column, the bill is slated for a floor vote in the Minnesota Senate on Monday, March 25. However, the Senate bill is not identical to the House bill that passed last week. It includes "a GPS loophole" that would allow drivers to use a handheld phone while interacting with the GPS. This is obviously very unsafe and will absolutely compromise the total essence of the bill. I just hope that sanity will prevail and the final bill that goes to the governor’s signature does not include the GPS loophole. As citizens we have the responsibility to ask our Legislature to pass a bill that encourages safety. 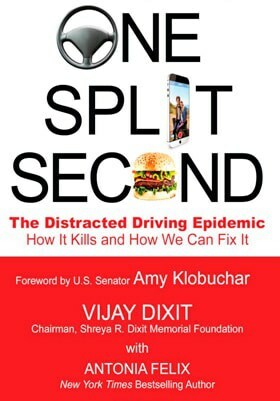 I am sorry to include the same table I had last year’s column showing how 13 states in the nation saw more than 20 percent reduction in fatalities after the passage of hands-free bills, like the Minnesota bill. Interestingly, in the past year two more states have become hands-free. Polling and surveys show total public recognition of the problem and staunch support for policy and enforcement actions. Let us remember that distracted driving is not a victimless crime. Do not forget that our right to safe roads is more important than the right of a driver with a phone in hand. Is Minnesota ready to set an example? Good question! Please write to me at vijay@shreyadixit.org. I will wait to hear from you.